If you didn’t know the difference between a Stegosaurus and a Stegoceras, you will after you go through this 50 card deck. Joined at the bottom, so you can fan them out, this is a great travel, restaurant, or everyday must-have for the dinosaur enthusiast of all ages. Each dinosaur is illustrated in lifelike detail and accompanied by information – on both sides of the card – on size, diet, lifestyle, and the meaning of their names (Allosaurus means “strange lizard” – hmmm, you can still find a few of those prowling lounges in Vegas). All your favorites are here, plus some unusual ones like Bambiraptor (yes, named after Bambi), and Excalibosaurus (named after King Arthur’s sword because of its long snout). 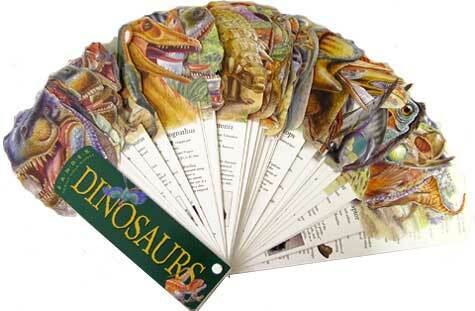 The deck also includes key paleontologists, fossil finding methods, and a glossary. The deck is a little over 10″ tall. Tags: book, cards, deck, fan, fandex, illustrations.